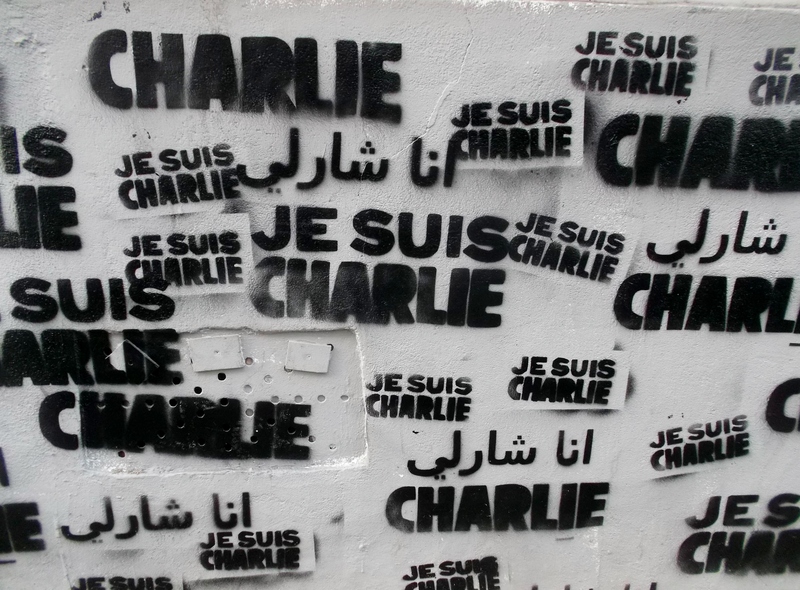 Expressions of ‘Je Suis Charlie‘ quickly appeared everywhere after the horrific January 2015 terrorist attacks in Paris. This one was painted on to the front corner of an apartment building in Montmartre, close to where I stayed during my second week in Paris. It will be difficult to ever forget about the horrific events that took place in Paris, starting on Wednesday January 7, and ending on Friday January 9, 2015. I had no idea that the regularly scheduled monthly test of the startling and eerie-sounding air raid siren at midday Wednesday would be a harbinger of what had just taken place a short distance from my rendez-vous point with a French friend. That afternoon, just after lunch hour, I was to meet Magali (the mother of friend Gildas, the groom-to-be) in a café beside the stately neo-classical Notre Dame de Lorette Cathedral. She was going to take me to some smaller, lesser known museums and sites in the New Athens area of the 9th arrondissement. I arrived in good time.While I sipped my café au lait, I noticed that customers seemed to be glued to the TV screen located behind my left shoulder. I turned my head to take a quick look, and could see police and soldiers in combat gear with guns and a number of ambulances in front of a building. I hastily assumed that something bad had happened somewhere in the world and immediately thought, “how sad.” In the din of the packed brasserie, I could not make out what was being reported on the French TV channel. Then Magali came along, followed by Carole, the bride-to-be. After a quick greeting and orders for café, they turned their immediate attention to the TV screen. “What’s going on?” I asked. “There was a terrorist attack at the Charlie Hebdo satirical magazine office,” said Carole, “It’s not far from here,” she added. Feelings of shock, fear and disbelief stunned me momentarily. “Should we go out?” I wondered aloud. “Of course, we will be fine,” Magali replied. Although I was a bit nervous, we ventured across the road to the cathedral. We entered its peaceful interior and I immediately felt calmer as we quietly admired the paintings and sculptures there. 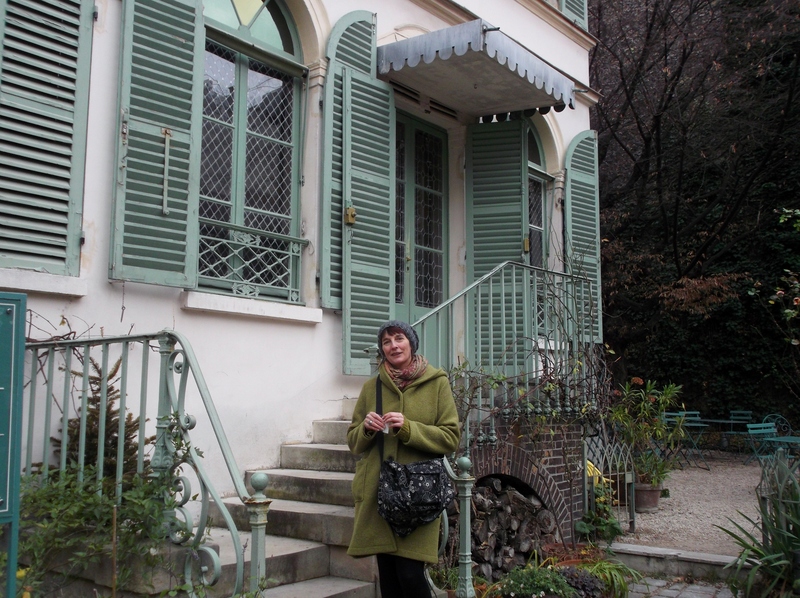 Magali stands in front of the Museum of the Romantics, the former house of painter Ary Scheffer in the New Athens district of Paris. favourite époque! We ducked into a tidy lane-way where I gasped with delight at the sight of a perfectly preserved 19th century mansion, aptly named ‘Museum of Romantics‘. Its contents focussed on the works of some of the then-thriving artists, musicians and writers of the first half of the 1800’s. Painter Ary Scheffer, whose family owned the house at that time, would regularly entertain other renowned neighbours in his studio there, including: writer/painter George Sand; musician Chopin; painter Delacroix; composer Rossini; pianist/composer Liszt; and others. While a soothing background of recorded Chopin piano nocturnes diminished my uneasiness about this strange day, I admired paintings, sculptures, letters, and jewelry belonging to these famous French artistes, which included a cast of pianist/composer Chopin’s left hand! 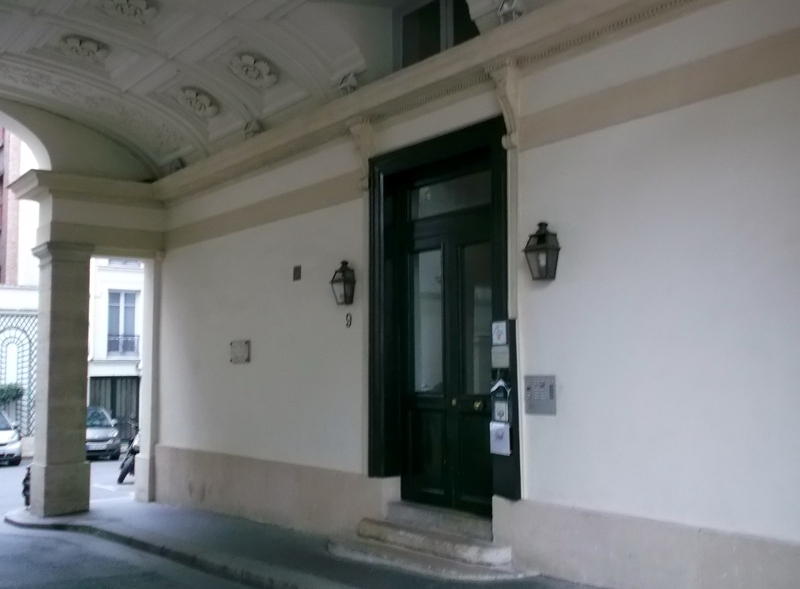 Chopin once lived here, a short walk from his friend, painter Ary Scheffer and very near to his ‘lover’ George Sand, a female writer. The space is now part of a business school. A small plaque is on the wall. 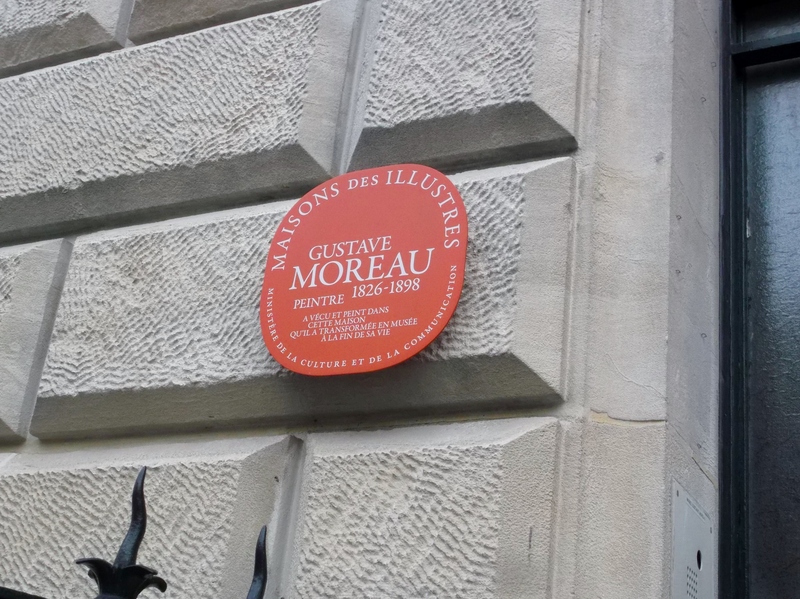 I did not get to see the Gustav Moreau museum. It’s on my list for next time! opportunity to return during this visit. To me, there were few people around. It seemed too still for a city as lively as Paris. On any other day, I would not have thought anything of it; however, something was going on that was not good and we were as yet, ignorant of unfolding events. We ended up at another beautiful church: the Sainte-Trinitie. Again, we went in and gazed in wonder at the plethora of sacred murals and paintings, as well as the Epiphany display for that recently concluded Christmas celebration. It was almost dark by the time we parted; Magali left me at the Métro stop right outside the café while she went in another direction to catch her train. When I reached my AirBNB apartment in Montmartre about half an hour later, I still had no idea of what had really transpired that afternoon. I turned on my tablet to find an email message from Elsa, my lovely AirBNB hostess. She advised me that I might find roads blocked and subway delays in my area, as the terrorists had made their escape on a main route very near to me! My anxiety mounted a bit, but it had been a few hours since she sent the note, so I knew I had to find out what was going on. I could not figure out how to operate the European TV, so I resorted again to my trusty tablet. I read reports from French, British, Canadian and American media outlets to get a sense of the magnitude of this debacle. Meanwhile, emails and texts arrived from family members: a cousin who is a retired ‘Mountie’ (RCMP officer) and his wife; as well as from my brothers and their families. They wanted to know if I was okay and what exactly was going on. I immediately responded to all, telling them that I was fine, and that they probably knew more about it than I did! Interestingly, I also felt supported by numerous friends and acquaintances who were sending me ‘good vibes’ telepathically from North America and the Caribbean. These strong positive feelings really helped me to dampen my fears, and to all of you, heartfelt thanks! I decided to stay inside that evening, and made an effort to find out what was going on. It seemed that the terrorists were outside of Paris now, but no one knew exactly where. I read as much as I could online. Admittedly, that night I did not sleep well. The streets seemed too silent: was everyone thinking the same thing? I even wondered if a curfew had been imposed, but my research disclosed that everything was operating as usual. 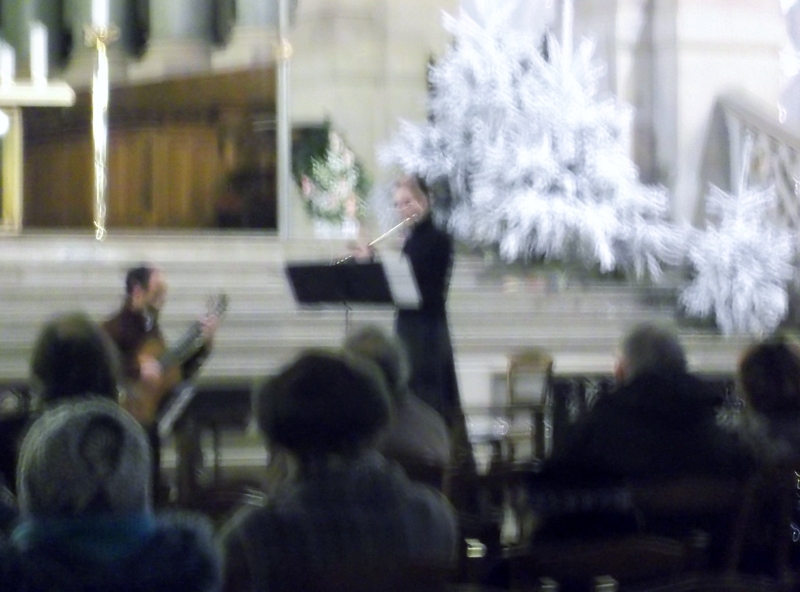 The guitarist and flautist who performed at the free midday concert at Trinity Church sounded heavenly. They also looked angelic in the dim light, as captured by my camera. The first of hundreds of Je Suis Charlie signs that I noticed around Paris. It was posted on a newspaper kiosk at Trinity Square, just across from the Trinity church. magazine/newspaper kiosk near the church. I also saw that it was closed for business. Although the musicians had taken their places, not one note was played until the MC asked the gathering audience to honour the lives of those lost in the previous day’s attack by paying tribute to them with a minute of silence. I could see without a doubt that the French were deeply moved by this horrific event and paid respect to their lost countrymen and women frequently during the next several days. When the flautist and guitarist commenced playing, I really wanted to cry. The beautiful blend of their sweet harmonies floated to the roof, and perhaps beyond, and the ethereal sounds freely resonated within my heart. I could only feel peace and love in these sacred surroundings, and the joyful noises encompassed everyone in serenity, at least for a short while. For an hour, ‘all was calm and all was bright’ in that lovely sanctuary. When it was over, I happily made a small donation to the church fund. I wish I could have personally thanked the musicians for their uplifting gift on a such a sad day. I hope this brief mention will suffice, in some way. 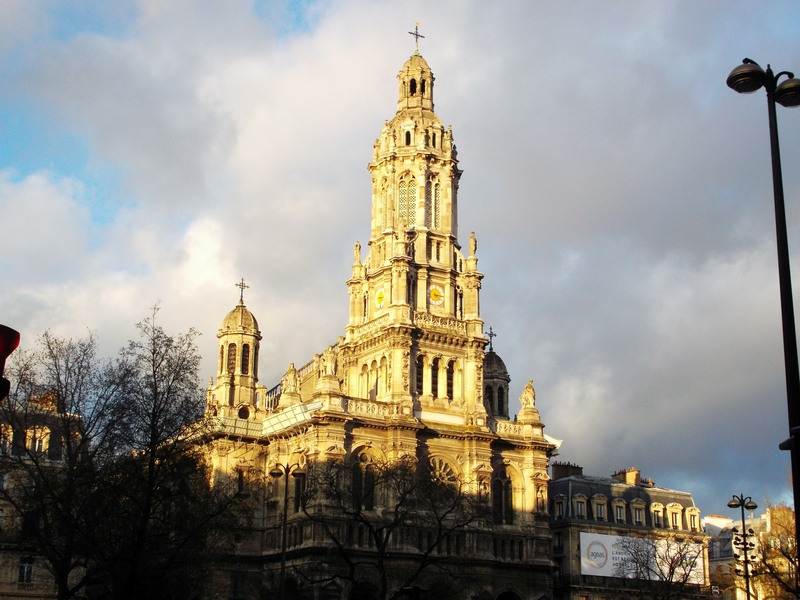 Trinity Church, located at Trinity Square in the 9th arrondissement had an etherial glow in the late afternoon sunlight following the wonderful concert. I then spent part of the afternoon ‘window shopping’ in a district that was jammed with people taking advantage of Paris’s semi-annual sales. I contented myself with wandering around in the crowds, unaware of the latest developments in the terror crisis until later that evening. 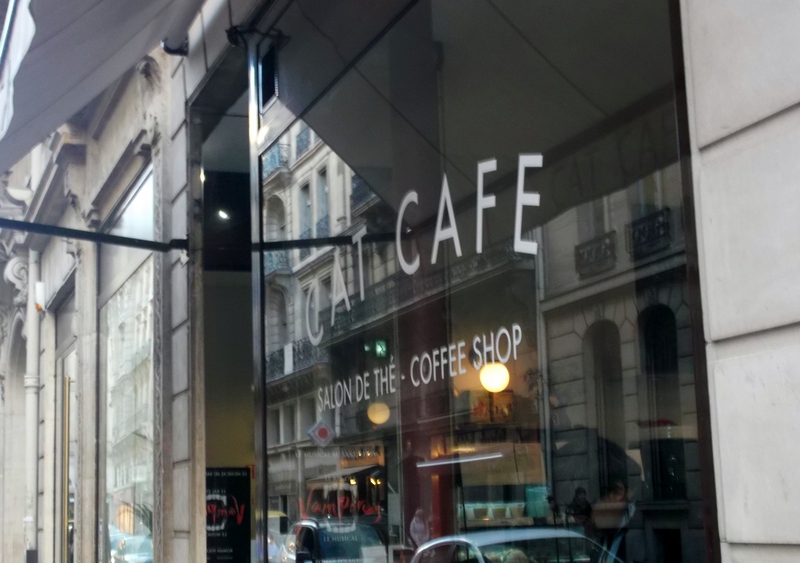 I happened upon a cute little café that caught my eye: The Cat Café, in fact. Well, with a name like that, how could I, a cat lover resist going inside. The Cat Cafe is a cool place to catch a cuppa. It’s located in the shopping district, near Trinity Square. This time, I had organic English breakfast tea, along with a piece of carrot cake made with wholesome ingredients. After I had finished the tasty treat, I chatted amiably with one of the owners. We shared stories about our mutual love of cats, and I listened with interest when she explained that tourists were attracted to the café, not only because of its quality products, but because they speak English, as well as other languages! She also updated me on the terrorist situation: they were still at large and now a police officer had been shot and killed in Paris.Terrorism was felt to be the motivation behind this senseless slaying too. I had help from friends Jenny, Georgie and Gijs to interpret this poster that I saw on a shop door in Montmartre. 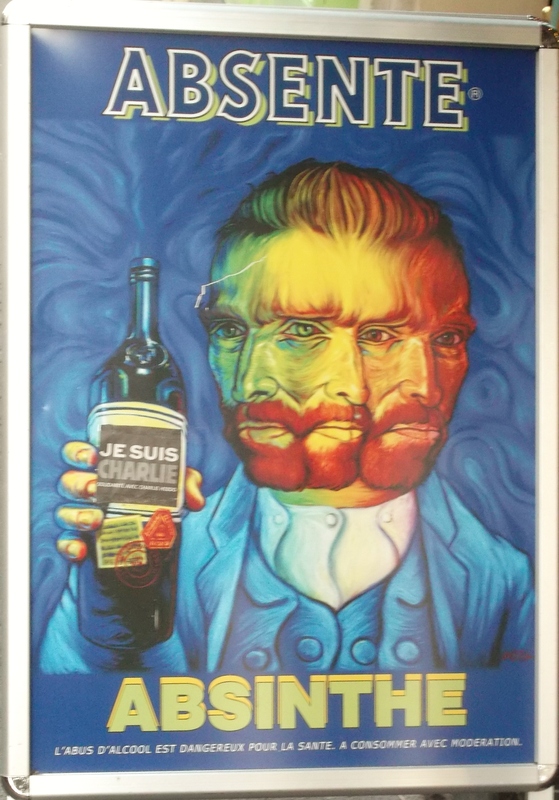 ‘Je Suis Charlie‘ was affixed to a poster of Van Gogh (Absente) with the poisonous drink, Absinthe. Very meaningful! Once again, feelings of uneasiness surfaced as I headed for the Métro to return to my guest apartment at Montmartre. However, others on the street appeared to go about their business, and only paused momentarily with frightened looks when police vehicles with sirens blaring occasionally roared by. As everyone knows by now, these traumatic episodes climaxed on Friday January 9, 2015 with the hostage taking and murders of some of the people in the Kosher Grocery Store, and the fatal shooting of three terrorists (two from Charlie Hebdo and one involved in both the grocery store incident and the police officer’s death on Thursday the 8th- the female accomplice is still at large as of this writing). I would say that the city breathed a sigh of relief, except that there was understandable anger and a collective desire to express unity against these horrific acts. 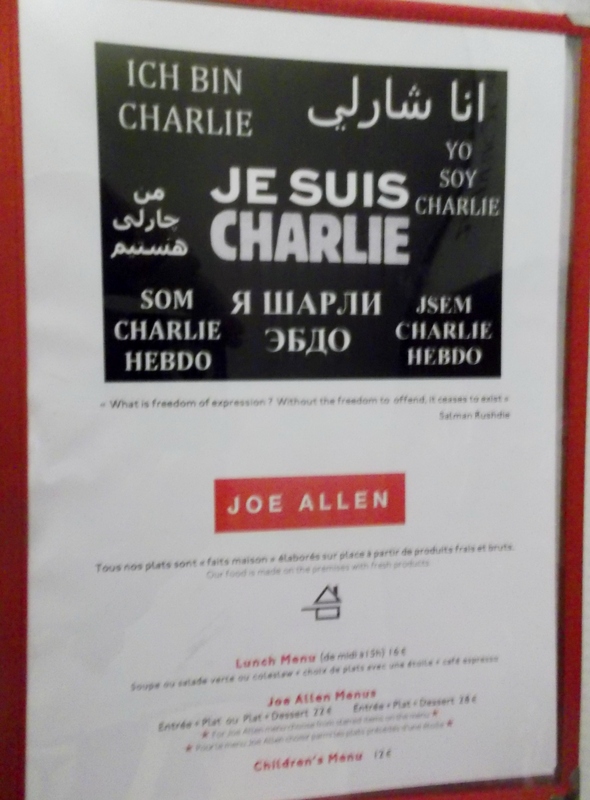 The American-owned Joe Allen Restaurant and Bar publicly expressed support of Charlie, along with thousands of other establishments in Paris. By Friday, there was a police presence in strategic locations, including tourist sites. I tried to get used to walking alongside soldiers with sub-machine guns ‘at the ready’, strapped across their chests. I wondered if it was safer to walk beside, behind or in front of these highly trained military personnel. I also realized that I was learning a lesson from the tenacious French, who throughout their history had experienced many tumultuous events and still believed that ‘Life Goes On’. Yes, indeed, I was carrying on. I also witnessed the courage of the people and their firm intention to gather peacefully to show terrorists that they would not ever be intimidated by their heinous acts. Sentiments about the fundamental right of Freedom of Expression are definitely alive and well in the City Of Light too. The massive public demonstration of millions, along with world leaders in the streets of Paris on Sunday January 11th made it very clear to me that Liberté, Égalité and Fraternité (Freedom, Equality and Brotherhood) are principles to which we must all aspire for a better world. I think that my coincidental visit to Paris during these attacks has reinforced my beliefs about being courageous in the face of fear and walking freely to my own beat, even if others might think that my steps should have a different tempo! * This piece is dedicated to Magali Rouland, who took me to see some bright sites in the City of Light on an otherwise dark day. I sensed the strength and fearlessness of Parisians everywhere we went and I admired their tenacity and bravery, which is ever-present. This entry was posted in Canadian Expatriates Blogs, Chemical Sensitivities Blogs, Chronic Fatigue Syndrome (CFS) Blogs, Environmental Illness Blogs, Gwen Whitford Dominica, Gwenith M. Whitford, Multiple Chemical Sensitivities Blogs, Uncategorized and tagged 8, 9 2015, Attack onCharlie Hebdo Magazine Paris France January 2015, Canadian in Paris France January 2015, Editorial Perspective on Je Suis Charlie by a Canadian Tourist, Je Suis Charlie Paris France january 2015, Paris France January 7, Terrorism and Tourists in Paris France January 2015, Terrorism Paris France January 2015, Terrorist Attacks Paris France January 2015, Terrorist Attacks Paris France January 2015 Commentary. ← A Canadian Canary Visits Paris: Food, Fabulous French Food! Here is an overview of Gwendominica’s experiences during the January 2015 terrorist attacks in Paris. I’m glad you were able to find lightness in that dark time – thank you for this account, Gwen. Thanks Rachel. 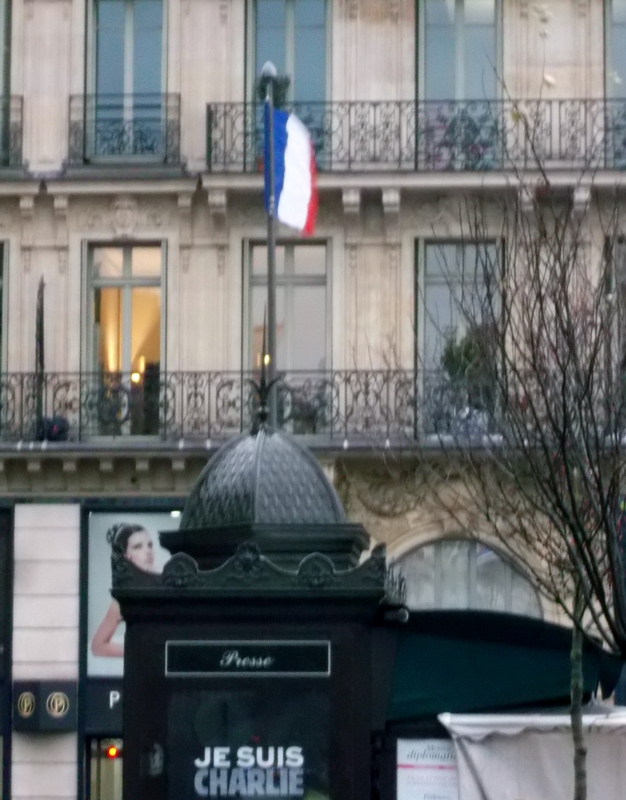 I am still thinking about what happened in Paris and how I was affected by it. I am reminded to practice the principle of peace – in all aspects of my life. It couldn’t hurt. Good vibes to you! Thank you for this article Gwen, I must say I cried reading it. Like most French I feel wounded at the core by these attacks. But I’ve always loved your capacity to see the good in everything, and it is particularly welcome at a time like this.